What is the focus of our education now? In general, nature becomes the central point of education; nature to be objective. Humans become "slaves" of nature; science, technology and and the things that are pragmatic, including the most important money took place. Human-centered education is getting knocked out.It can not be separated from the most influential figure in the world of education, John Dewey. He figures the U.S. education in the early and mid-20th century and the concepts of pragmatism. Dewey said that education is a growing personal adjustment to its environment (education is "Adjustment of the growing personality to its environment). He makes the environment at the center of education. To Dewey, humans have adapted to their environment without specifying the definition of" environment "(environment) is clear. " The country's elite education John Dewey in mind slipped Law. 2 of 1989 on National Education System. More obvious was inserted in Article 15. At the writing of this article, "Secondary education is organized to continue and expand basic education and prepare students to be members of the community who have the ability to hold a reciprocal relationship with the social environment, culture and natural surroundings as well as to develop further skills in the world of work or higher education.At Law No.. 20 Year 2003 on National Education System, the philosophy of pragmatism is still strong even in the law does not mention vulgar. However, in daily practice, mind John Dewey was the one who dominant. Humans are the most important thing of all is created; humans should be the focus of education.This is in accordance with the values ​​of Pancasila. Even in view of the religions of the East, which is considered as a monotheistic religion, man is the central figure in the creation. Everything is created for humans. God created light, horizon, sea, land, all kinds of plants, sun, moon, stars, all the living creatures in the sea like fishes, and in the land, and all kinds of birds in the air. And lastly, He created man.Man is the crown of all creation. He is the center of the universe.Everything has been provided before humans existed on earth. Even the beautiful garden, the Garden of Eden was, prepared for them so that husband and wife first in human history do not bother to look for their daily needs.Not only as the crown of all creation, man was given the task to control the entire creation-from the fish of the sea and the birds of the air, and all the creatures that move on the earth. The entire universe is in the power of man.It is ironic look at our education. Man is not the most important figure in the world of education. Humans are not the focus of education, but the focus is money, profit, curriculum and various other things that are included in the category of nature. Philosophy of John Dewey's pragmatism was the one that was dominant in the world of education, philosophy contrary to Pancasila. The country's elite education John Dewey in mind slipped Law. 2 of 1989 on National Education System. More obvious was inserted in Article 15. At the writing of this article, "Secondary education is organized to continue and expand basic education and prepare students to be members of the community who have the ability to hold a reciprocal relationship with the social environment, culture and natural surroundings as well as to develop further skills in the world of work or higher education.At Law No.. 20 Year 2003 on National Education System, the philosophy of pragmatism is still strong even in the law does not mention vulgar. However, in daily practice, mind John Dewey was the one whodominant.Humans are the most important thing of all is created; humans should be the focus of education.This is in accordance with the values ​​of Pancasila. Even in view of the religions of the East, which is considered as a monotheistic religion, man is the central figure in the creation. Everything is created for humans. God created light, horizon, sea, land, all kinds of plants, sun, moon, stars, all the living creatures in the sea like fishes, and in the land, and all kinds of birds in the air. And lastly, He created man.Man is the crown of all creation. He is the center of the universe.Everything has been provided before humans existed on earth. Even the beautiful garden, the Garden of Eden was, prepared for them so that husband and wife first in human history do not bother to look for their daily needs.Not only as the crown of all creation, man was given the task to control the entire creation-from the fish of the sea and the birds of the air, and all the creatures that move on the earth. The entire universe is in the power of man.It is ironic look at our education. Man is not the most important figure in the world of education. Humans are not the focus of education, but the focus is money, profit, curriculum and various other things that are included in the category of nature. Philosophy of John Dewey's pragmatism was the one that was dominant in the world of education, philosophy contrary to Pancasila. He's not much use social media such as twitter and others. Although I am not an expert on communication, I think there are a lot of new communication patterns are evolving. After the outbreak of social media communication theory that long may have been updated by a new communication theories. Times change, and science is also constantly evolving. An educator needs to realize this, at least to be a motivation to continue learning. My conversation with the professor reminds me of the encounter with a teacher, about a year ago. In a training organized by the Indonesian Teachers Association (IGI), I met with a female teacher. He was probably more than 50 years. Her hair is white. His eyes were a little glazed. He told me that he was not actively teaching. Now difficult for him to find work. "What are you teach?" Asked me. The woman said that her expertise is teaching shorthand. Shorthand is a way of writing concise and fast, usually used to copy the conversation (www.wikipedia.org). Once students learn vocational department secretary. Also journalists. Now they have not learned it again. Now it appears that the role of stenography replaced by a voice recorder, video, or the ability to type quickly. So, maybe not so many users stenography. "Can you use a computer?" I asked, curious. The woman said that she could not use a computer. Typing could not. His expertise is stenography. "If there are vacancies for teaching stenography please let me know yah!" He hoped. I do not doubt the capabilities of both educators. They are experts in their respective fields. Eager to learn they were still high. The communications lecturer had asked me to write some website addresses that could be used as a reference for learning while the teacher steografi still eager to follow the various teacher training. However, times are changing so fast. What they have learned over the years and make them "successful" in the past apparently no longer valued as it once was. My second encounter with the educator leaves a lot of questions in my mind. How about the first science we learn now is not useful anymore? What if the work once we consider important now begin to disappear? Is sciences that we consider important indeed be as important in the future? What do our students learn in school really will they need? The times have changed, so how educators should deal with it? Computer technology in this day and age is already so advanced. Computers are often used to facilitate human work in order to get it over with. Can not be denied, that the computer is already a matter of public importance on this earth. Here I will discuss a bit about the role of computer technology, especially in the field of education. I'm here to directly address the role or benefits of computer technology in education that include e-learning. As we know that the concept should be applied at the present time is to be developed in order to avoid saturation in the learning process. Nowadays e-learning is the solution. E-learning is a learning system that uses computer technology and the Internet. E-learning is an acronym of the Elektronic Learning, a new way of teaching and learning that uses electronic media especially the internet as a learning system. E-learning is a basic and logical consequence of the development of information and communication technology. If we use a learning system based on e-learning, we will be much easier to find and obtain material or information. Just type in what we are looking for, wait a minute, we can direct the material. We can get a lot of material, not only from within the country, even we can find materials from overseas which would add insight for us and also to improve the results of our study. If there is a task, we can find the ingredients we need quickly. Should not thither to get the materials we need. Just sit in front of a computer or laptop, then look for what we need. After that, stacking task and finish. A student could have asked his friend what material is taught today or what a given task, if that day he could not leave for a reason. He can also ask directly what the professor had taught the material or what tasks it provides. In the interaction, he can use the medium of writing. He typed what to talk about or ask then sent to the addressee. He can also interact directly, can be face to face and talk directly with the person to talk to. Due to advances in technology, now it could happen with a tool called a webcam. Students can view the schedule or assignments given by lecturers who are already uploaded. So, the students already know what will be done today and can prepare early. An activity can be said to "learn" when to change behavior in a person. Changes in behavior it is usually temporary as the knowledge it receives. Whether learning can only be done in a formal environment???? unfair if this is the case. Learning can happen anywhere as long as it can induce behavioral changes in a person. A trader can be much faster in comparison to undergraduate mathematical counting for example, why is that? because traders learn from what they do and learning was done continuously. This is in accordance with the laws of learning connectionism theory exercises, which reads "the more often a lesson is repeated, the more it will mastered the lesson." Although not done in a formal environment, a trader said it was able to learn because he has done a study that is between him and buyers. The more buyers, the more often he learned (count). It is sufficient to prove that learning is not only done in the formal environment. Learning is very influential in the learning process. How someone can be said to do the learning? a person can be said to have done a case study two-way communication between students and teachers using the principles of education and learning theory, as well as traders who had been using the theory of connectionism. Quite another to learn in a formal environment involving teachers, students and the learning environment and have to go through certain stages of kindergarten, elementary, junior high, high school, to university. This learning is much more regular and organized since been adapted to the ability level of students both in the physical and life. Teachers as teachers have a very important role in supporting student success,. Teachers should be able to create a conducive learning so that students can be said to have learned. Discourse is the spirit that inspires the teachers to continue to strive to create meaningful learning for students. Perhaps many students who often complain of the presence of many of the tasks that the teacher "this task, a task that, many baget task. ", But it was nothing but an attempt of teachers to make students want to learn and optimize the potential of the students themselves to enable the objectives of the study itself is the change in behavior. This should be a challenge for students and raises confidence and motivation that "I can do it, I had to force myself to learn, when will I learn? yes from now this, well I have to be "forced Allohuma, that's called. During coercion was good for us, why do not we do? And learning that can be done anywhere and anytime as long as we want. Is not the experience is the best teacher? So, let's learn!!!!!! Are You Ready?????? That reading can meet the needs of the intellectual aspects, the need to improve the quality of life of the universe, and have the ability to organize life. That is definition reading generally. But I will not go into more detail, I just want to inform a course outline before I discuss about how to writing simple. 1. Do a job that you like, such as cooking, gardening or anything what is related to your hobby. 7. note and note interesting things, and then develop the theory of 5 W (what, when, why, who, where and how) and continue to remember it and repeat constantly. The human brain is 64.8 km in length intercept is in the brain, then the act of reading, which sendor eyes read the letter symbols will extend our brain which weighs less than 1.5 Kg, where the active cell is no more than 100 billion in the brain, compared to a monkey which has 10 billion, while the mice five million 100 thousand flies. Then the reading will affect the right brain is usually to increase creativity, left brain as brain structural and midbrain as the alignment between the right and left brain. there are words: one, the queen and shoes (suffix tu behind the words to facilitate the learning of writing after doing readings). Let us learn to weave words - these words into a sentence like the one below. 2. Every one of the queen to use always use shoes as a sense of joy, because every one of the queen always remember that shoe as the date of the special items of her beloved husband. Above example there is a very simple example, I hope that it can be used as study materials for all of us. Good luck. "The world of child is a world of play while learning," wrote Hedy Lim, one of the teachers who have been certified professional teacher of Teacher Education and Professional Training (PLPG), in his article in Kompasiana. Read a quote that as teachers we certainly agree, it's just a lot of consideration to start applying it in the classroom. Starting from the consideration of the seriousness of the time it takes students to follow lessons. Apart from the above assumptions, playing while learning remains the most effective method of learning. With this method the students to be more creative and active, they also become more fun to follow the lessons and not easily bored in class. In addition, students can also acquire some additional skills beyond the material being taught. First, students can learn through the running game. Rebekah said that the game the students can learn to understand concepts and new ideas in learning. They also can see what is being taught from the perspective that they have not known before, so they will start experimenting with the possibilities and new variables. He pointed to a card game that is often used with students in the first week of lessons. In that game, the students were divided into groups consisting of 4 to 5 people, they play according to the instructions on the card they get. Each group gets a different game rules. The game was running with full solemnity in each group. After the first round, the winners of each group had the opportunity to move to another group. In the other group, they get different rules with the previous game, so it must adapt to the new rules. There are many who do not accept and say "bermainmu wrong way," to other students at his new group. Rebekah It is used as the starting point in explaining about the transfer of a person from one area to another. He had to immediately adjust to the new situation in the region. "I tell you my personal experience when moving from Spain to Venezuela and then to the United States. At first, I felt that the people there speak the language wrong, "he continued. The game continued, but with tolerance to discuss new rules to the players who had just moved from another group. In the final game, they begin to understand that the purpose of the game is to explain the importance of learning a new language. Until there was one of them said "I know, it turns out you are trying to show us why we need to learn another language. So that we can learn from each other. " Secondly, the game can become an intermediary to engage students in the learning process. Some subjects require activeness of students in it. Like learning a foreign language that requires insight into how the pronunciation and vocabulary mastery sufficient. With the game, more teachers may invite them to say a few words or sentences, so indirectly they have practice saying the words and sentences. This method was more effective than what is in the textbooks that many foreign language vocabulary lists. "I used to take the students to play 'charades', so they are compelled to pronounce the answer of the puzzle that I gave to the vocabulary and sentence structure are correct. Repeatedly they get the exercise they need, "said Rebekah. Third, the passing game students can learn some important skills. There are so many skills that can be learned by students through games, such as critical thinking skills, creativity, team work, and sportsmanship. For example there are some lessons in basic skills is important, such as skill in the use of the word too much. "To practice, I used to take the students to play 'charades', after the game finished, I felt a rapid increase in the students' skills in using the word in large quantities," he said. Fourth, the game may be one factor memory booster. During play, without realizing the many students interact with the material being taught, this may be one factor that makes them easy to remember the material. In the game, many students pass through difficult moments they forget, in this case Rebekah his experience "moments that I liked for teaching is when it comes time to play. I will never forget when Miguel, one of my students, ran around the class to tell his classmates the meaning of the word 'mono' (monkey), I'm sure his friends will not be able to forget the funny moments. " By varying the type of game that we give, the stimulus received by students will vary. 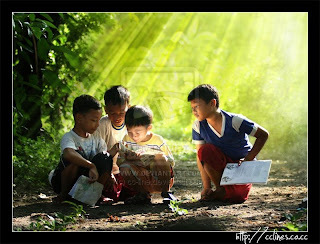 Some children with memperagakannya remember something, the other with the given clues that lead to something, there is also remembered having heard his friend screaming to answer the riddle. "Positive feelings that can support learning expressive" Rebekah said. Fifth, the game can absorb the attention of students and engage them in the learning process actively. Because the students really liked the game, it can be a good way to concentrate focus while absorbing their attention. Some phenomena may be able to explain this. After passing through the long vacation, the students usually look very energetic and easily bored sitting. At times like this the game that takes a lot of energy to immediately restore their minds to the lessons, so that they can come back ready to receive a new lesson. "The game can quickly engage them in the lesson and restore their mind to the material we are teaching" wrote Rebekah. Children grow and develop through play activities. The more they enjoy the learning process, the more material is absorbed and understood by children. The process of teaching material by the teacher to the students own more than just the transfer of information. Students need to understand the concept of the material being taught in order to master it well. Well, to make learning fun, students will be able to more easily understand what is being taught. Arts educators have for years been telling school reformers obsessed with reading and math that the arts teach valuable skills and ways of thinking that can help academics. Here cognitive scientist Daniel Willingham writes about a study that shows a link between music training and reading. Willingham is a professor and director of graduate studies in psychology at the University of Virginia and author of “Why Don’t Students Like School?” His latest book is “When Can You Trust The Experts? How to tell good science from bad in education.” This appeared on his Science and Education blog. One sometimes hears the inclusion of music in the curriculum justified by the claim that it improves mathematics or reading. In this study 159 German first graders participated. The music training lasted eight months and focused on three areas: rhythmic skills training, tonal/melodic skills training and auditory discrimination of timbre and sound intensity. There were two control groups: one received no training. The other was an active control receiving training in art. What’s behind the benefit? Language does have a musical aspect to it, referred to as prosody. And indeed, children’s ability to appreciate the rhythmic aspect of speech is correlated with the ease with which they learn to read, even when controlling for phonemic awareness. In German (and in English), certain letter combinations signal certain stress patterns, so there is a signal in the written language that children can learn. The idea is that children are less likely to learn the association of certain written letter patterns and their corresponding rhythms in speech if they don’t perceive the rhythms of speech very well. The argument predicts that it is rhythm that’s important, not tonality, and the data do show significant correlations of reading with ability in the former, but not the latter. All in all, this study seems to be an important addition–although certainly not a conclusive one–to the argument that some types of music training aids children’s learning to read, at least in certain languages.